Here's the million dollar question most of my students ask: I can do it once, why can't I do it all of the time? Practice techniques and on-course strategy will help you to repeat good shots. 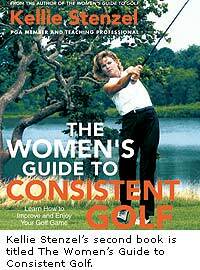 Here are some of the suggestion you will find in my second book, "The Women's Guide to Consistent Golf." 1. Have a set up routine. A set-up routine will put together your grip and posture. Repeating a good set up makes consistent shots possible. An example of a set-up routine that would work would be “club-hands-feet.” Start by setting your club to your golf ball. You should aim the face at this point. Bow forward from your hips and place your proper grip onto the club. Lastly, step your feet to the point that your hands hang directly below your shoulders. This routine will allow you to have a set up that will work for all of the different lengths of golf clubs from the shortest to the longest. 2. Practice with a set-up station. By placing an alignment club down on the ground when you practice you will be more productive and learn to aim all at the same time. Place the club on the ground, just outside of your golf ball so that the shaft points just slightly right of your target. When you set up, be sure to set your clubface perpendicular to this shaft and the line through your toes parallel to it. 3. Have a plan for your practice time and be sure to include your short game. I understand that when you were a beginner more of your time was probably spent on your full swing because of the need to feel that you could at least get there first. And it is a lot easier to fake the short game than the full swing. But now that you are a more experienced golfer, you must commit some of your practice time to your short game. Devote 50 percent of your practice time to your short game. 4. Apply quality goals to your practice time. You can make a three-foot putt, but can you make 10 in a row? If you miss the ninth, you have to start over at zero. By applying this pressure to your practice you can replicate the pressure that you face on the course. Quality practice versus quantity can help you to be more consistent under pressure. You can apply this technique to all areas of your game. 5. Lower the degree of difficulty of the shots you select. Rather than trying to hit the perfect shot, you will be better to choose one that is more realistic and possible. For example, rather than trying to tee off with your driver, you may find it more successful if you choose a 3 wood. For the small amount of distance you might sacrifice, you will gain in constancy and confidence. My wife just purchased your first book. It's great. We took up golf seriously last year. We are 58 and 57 years old respectively... and we have been married for 37 years this year abd athletically we are great shape. Both of us are improving and your book was a great help. However, we are suffering through the notorius "head lift" in recent weeks. Help! It is driving us nuts. any suggestions. Also, do you do any vacation camps down South during the winter? We would love to attend.